Recently on Facebook I saw a photo posted from one of our volunteers, Michellana, who has been teaching on the island of Chuuk this year. 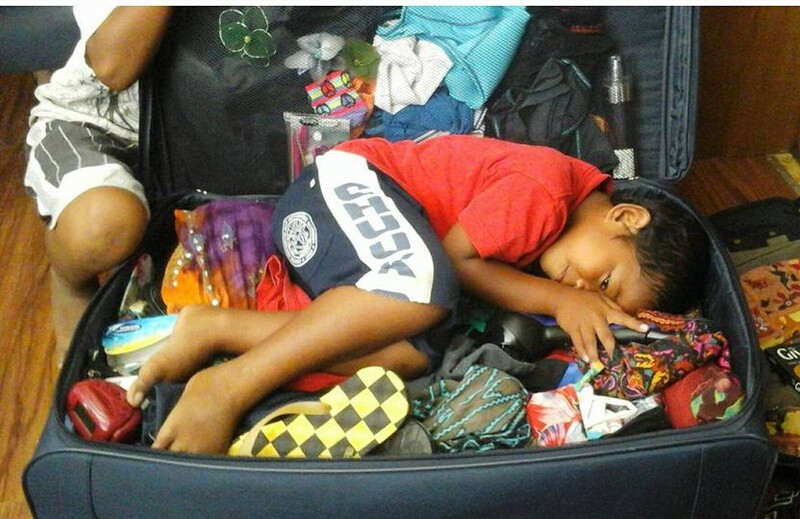 The photo shows a suitcase filled with clothes and just enough space for a little boy with “Chuuk” printed on his shorts to lay down inside. It’s super cute, but also tugs at my heart because I remember that feeling well, and I know many of you are going through the same thing right now. How hard it is to say goodbye to a whole world of people and memories, challenges and growth. Well, it is harder for some than others, depending on your experience. But there are certain people—often “our” kids—that we wish we could literally just pack up and take with us. They have become such a part of our hearts, and it’s hard to imagine how we will leave them behind, and how they will get along without us. But the time comes for that last wave, the last group picture, those last hugs as we leave each other in God’s hands. Even in the pain of goodbyes is a reminder that God uses relationships to most powerfully communicate the Gospel. If it was only about information, we could save a lot of time, money, and even tears and simply flood mailboxes with books. But the catalyst that brings the Gospel to life is living in connection with others. God uses community to transform our own lives and to tell the story of His grace in a language embedded in the human heart. However challenging it may be, thank God for this “relationship plan” that He Himself modeled through Jesus to powerfully reach into our core in a way nothing else could. Maybe relationships are something you have struggled with in your mission experience. Quite likely, every one of us is challenged at our deepest level in this area at some point. This is often the area the enemy attacks most frequently, especially with those actively engaged in God’s work. Unfortunately, sometimes we do “pack home” the wrong people in some extra baggage we should have left behind. But even the deep pain in those experiences can be redeemed in God’s unlimited grace. I encourage you, wherever you are at in your journey, to take time to consider the value of your relationships as you serve overseas or transition to serving back home. Seek God’s leading and wisdom to know how and when to say goodbye, to forgive, to hold on or let go, to be open to restoring lost or building new relationships. Mostly likely, you will find God’s grace come alive as He uses these relationships, messy as they are, to transform your life and those He calls you to serve. *About every other week, we send out a short devotional to our volunteers. This was written by Andrea Keele, and sent on June 1, 2015.